After the second Toji Riichiro Nagaswawa had resigned the Toji and assumed brewing counsellor, Isao Takahashi assumed the Third Toji of Takashimizu head office brewery. Takahashi also came from San-nai area in Yokote city same as his predecessors. 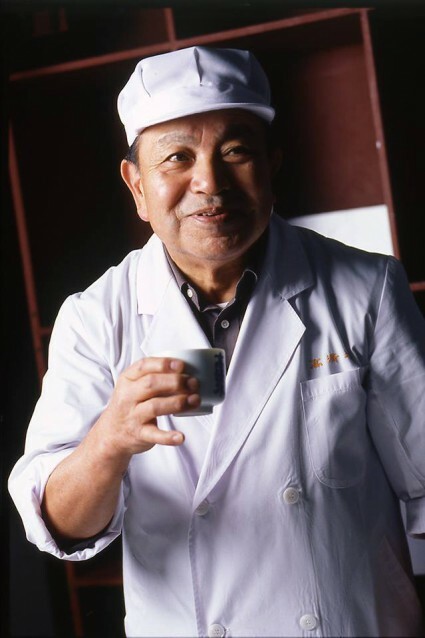 Takahashi entered the company as a seasonal worker in 1951 when he was 17 years old. Continuingly, he assumed a chief of Shubo in 1960, Moromi in 1979, and as a deputy Toji in 1989. After that, in 1996, he was appointed to Toji and received prizes over and over at various sake competitions. Then all Takashimizu breweries at the time (Head office, Nakasen, and Goshono) received Akita Governor’s Prize at Akita Prefectural Sake Competition for 3 consecutive years from 2002 to 2004. These records were brilliant feats and the then president of Sannai Toji Union praised them as Takashimizu created new history in sake brewing history of Akita. It goes without saying that Takahashi played important role for these feats as a Toji of head office brewery. Takahashi valued not only “sake brewing” but also “development of human resources”. He encouraged brewers to study sake brewing and to challenge the state examination of licensed brewer. While he listened to brewer’s opinions carefully and respected their intention, he also imparted his knowledges to them strenuously. When brewers asked him about sake brewing, he answered “that’s fine thing to point out. Very good question. Have doubt, ask, and remember on and on” and respected their motivation to learn. This episode proves his kind character to value the relationship among brewers.